Over 90% of car shoppers go online to winnow their choices --but often the make-or-break, even if they are sure of what they want, is the dealership experience. And that’s not just an issue in the autos category, with the obvious example the difference between the coddling you get at an Apple Store versus the frequently alienating experience one gets at the average electronics retail chain, where customers are often treated like one of the appliances. The research firm Lab42 says it has data suggesting that among auto shoppers who spend one to three months building up a list of car or truck possibles, half get to a dealership without having made a decision about the model they want, much less how they want it configured, and 81% of them say they are less apt to buy if their salesman pulls a hard sell. Denogean points out that in an effort to help ameliorate that problem, automakers have been at pains both to simplify the digital consideration and configuration phase, while nudging dealers to rethink how they treat customers -- a process in which she and other marketer/analysts have commented on and participated. Lab42, meanwhile, finds that 91% of shoppers bring someone with them when they go car shopping. Men are twice as likely to bring a parent or friend, whereas women are more likely to bring their spouse or significant other. Also, among the 500 recent auto buyers polled, Toyota has the most loyal buyers, followed by Chevrolet and Honda. Table stakes for 46% of shoppers are keyless entry and GPS, 41% say they have to have blind-spot sensors, while a surprising 32% want heated seats. The firm said 66% of respondents were looking at hybrids, about 60% mulled both new and used cars, and just under 30% equivocated between leasing and buying. 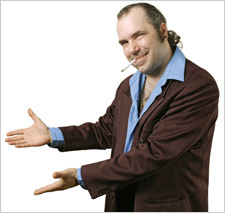 "A Sleazy Car Salesman photo from Shutterstock"